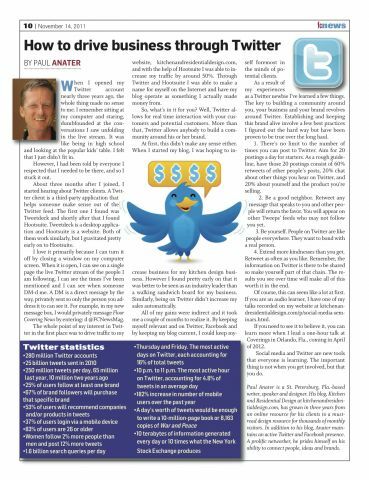 Floor Covering News just published its annual social media guide and this year, they picked me to write an article about how businesses can use Twitter to their advantage. Here's a screen capture of my article and here's the link to the whole publication. My article is on page ten. The last few weeks have been pretty great, the trade show Coverings just hired me to be a speaker (I'll be talking about Twitter of course) at the show in April and just last week Real Simple Marketing named me the world's third most socially influential blog when it comes to the flooring industry. I must know what I'm talking about! Thanks! And great points in that article you wrote as well.